Tangoinn is fantastic!!! ... LA pasé genial en Tangoinn Bariloche, el servicio y la atención del staff es buenísimo, las fiestas y las comidas son muy divertidas y baratas. La ciudad es hermosa, el ski, los lagos, todo muy lindo. The city of Bariloche is the door to Patagonia Argentina. 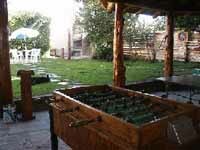 Its located in the heart of National Park Nahuel Huapi and surrounded by beautiful lakes. 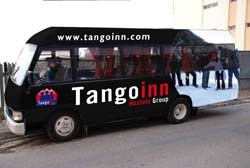 Tango Inn is 5 blocks away from the bus station. Its a comfortable and warm place, well equiped and very clean. The entire building is heated and theres ht water the 24 hours of the day. We count with bar service, restaurant, playroom, laundry facilities, internet access, cable TV and VCR; tourist information, free lugagge store, book exchange, bbq area and garden. Breakfast is included and food and snacks are served allday. Besides, we have the best espresso and capuccino of Bariloche. We rent bicycles and help you organize your stay and excursions. Rafting, trekking, sky, snowboarding and all kinds of adventures can be made in the National Park. We have 30 rooms with private bathroom, for two and three people, and dorm style with four beds.